Attorneys James Magleby and Christine Greenwood established Magleby Cataxinos & Greenwood, as a boutique litigation firm dedicated to providing its clients with creative and effective solutions to challenging business and civil disputes. Together with their partners, Peggy Tomsic, Eric Schnibbe and the firm's associates, the lawyers have formed a tightly focused practice handling select cases, including trademark and intellectual property litigation, complex business disputes, construction litigation, and civil appeals. The firm's strength lies in its commitment to finding practical and innovative solutions for unique and difficult problems. Some litigation firms base the decision to accept litigation cases solely upon the probability of winning. At Magleby Cataxinos & Greenwood, this decision is based on a broader variety of factors, including the validity of the case, the client’s long-term business goals, and the client's well-informed decision. At the initial client meeting, or as soon as the necessary information becomes available, the firm's attorneys evaluate the case and provide the client with candid advice regarding the validity of potential claims and the chance of success at trial. If the client elects to go forward with litigation, the attorneys commit themselves to the cause, welcoming the challenges presented by complex and difficult issues. 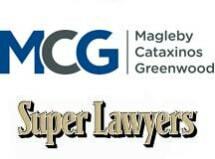 Attorneys at Magleby Cataxinos & Greenwood, bring exceptional individual qualifications, skill, knowledge, and experience to bear in their practice. As members of a boutique firm, lead counsel is closely involved with each case – from the initial case evaluation through discovery, trial preparation, and trial. The lawyers develop comprehensive knowledge of both the client’s business and the issues and evidence involved in the case, and they provide their clients with responsive and effective legal services. The firm has invested in the best and most advanced technology to support its practice and the needs of its clients, allowing the firm to handle larger and more complex cases in a cost-effective and efficient manner. Publications affirm the superior level of representation the firm offers in intellectual property, construction, and other complex business disputes. If you would like to speak with a member of the firm about a legal issue, please contact its office in Salt Lake City, Utah. Arrington, Mark P. Ph. D.